Ultrafiltration (UF) Water Systems utilizing (inside out) PES have a small pore size of 0.02 unlike the standard UF filters, which have larger pores. Ultrafiltration systems are ideal for high purity water systems like deionization and reverse osmosis pre-treatment as well as industrial feed water, river water treatment, municipal water treatment and industrial wastewater treatment among others. Liqui-Cel membrane systems are an ideal complement to ultrafiltration systems where ultra pure water is required. Ultrafiltration (UF) systems remove high-molecular weight substances such as colloidal materials, inorganic and organic polymeric molecules including all viruses and bacteria. 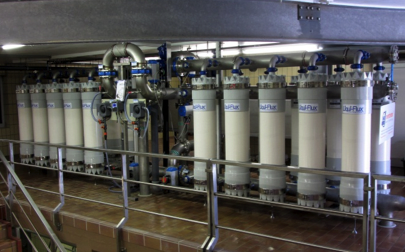 Ultrafiltration water treatment systems use pressure to separate the particulates from the liquid. Unlike a reverse osmosis (RO) system, which is used to remove total dissolved solids (TDS) and reduce conductivity, UF systems are used to reduce total suspended solids (TSS) and turbidity (NTU). Inside out configuration allows for less plugging and higher solids loading, higher flow area and easier cleaning utilizing cross-flow. Ultrafiltration membranes reject particles based on size, and act as a barrier allowing clean water permeate to pass through the system while the dirty water is removed as concentrate. Contact us now to have one of our engineers design an ultra filtration System for you or set up a pilot study.